As I said before, like Hyjal, Deepholm has a nicely streamlined questing process. It actually flows even better and there was pretty much no time I had to wonder around trying to figure out what to do next. Admittedly, there were a couple of quests that were harder to figure out how to complete, but I think that was mainly due to so many players still working on them that the enemy mobs or NPCs were just missing due to activity. The main quest goals were to fight against the Twilight’s Hammer (and other Twilight factions I think), gain the support of the elementals down there, and in doing both of these things, find the missing pieces of the world pillar that literally holds up the world. WoWWiki has a great quest list/guide HERE. I am pretty happy to report that some of the quests were relatively difficult, much more so than in Hyjal. Even still, there weren’t any group quests or fights that most any class shouldn’t be able to solo. On the other hand, the mobs hit HARD now and have 40k+ HP. I found myself healing often (go go hybrid class) and dead a few times when I though I could still kill 4-5 mobs next to a spawn point. Good times, good times. Prepare for upgrades here. After getting disappointingly few upgrades in Hyjal, I’m now (at level 83) sitting in a not-to-ugly set of gear that is mostly from the new instances, despite being an ICC25 geared player. Gear also comes pretty fast, many more quests have gear rewards than previously in WoW, at least it seems so to me. I’m sitting pretty at almost 65k HP as a DPS. The health is absolutely mandatory with how hard things hit. 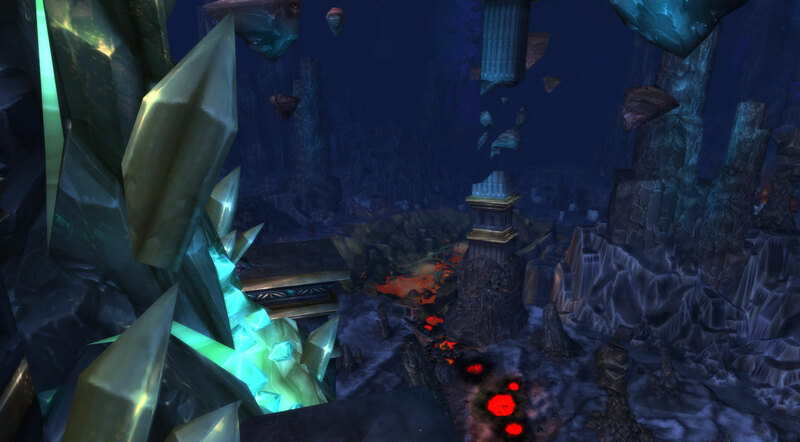 Here’s a mix of screen shots from Deepholm and a couple of the Maelstrom that you have to pass through on the way in. This entry was posted in Cataclysm, Daily, Screen Shots and tagged cataclysm, deepholm, hyjal, leveling, loot, quests, screen shots, warcraft, wow. Bookmark the permalink.